Equine Canada has named Viva's Salieri W the ‘Omega Alpha Horse of the Month’ for August. During the selection trials, Dvorak, who won the team silver medal at the 2007 Games, and Viva’s Salieri W earned 71.771% in the Prix St. Georges test and 70.351% in the Intermediaire I at Caledon Gold Dressage Show, held in Caledon, ON August 5–7. Two weeks later, at the Cornerstone Summer Classic Gold Dressage Show in Palgrave, ON, Viva's Salieri W, once again topped the score board with 67.632% in Prix St. Georges and 70.375 % in the Intermediaire I for a final ranking score of 69.947% for the two trials. “It is important for us to stress that our breeding operation cannot be successful without the riders and trainers that bring along our horses,” said Augustin Walch, who owns and operates W. Charlot Farms along with his wife, Christine Eppinger. “While we try to do everything we can to ensure the young horses can develop properly during the first three years of their lives, our success really depends on the riders and trainers that purchase the horses from us. 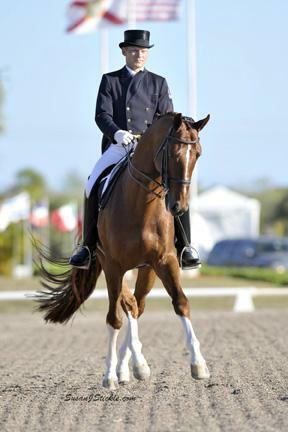 Viva's Salieri W is currently attending training camp in Gardiner, New York, September 25 to October 11 in preparation for the dressage portion of the Pan American Games, which will be held from October 16 – 19, 2011 at the Guadalajara Country Club in Guadalajara, MEX. The Omega Alpha Horse of the Month program was developed to recognize a performance of exceptional merit by a horse from the disciplines of dressage, eventing or show jumping. Equine Canada is very pleased to have Omega Alpha Pharmaceuticals’ generous support of the horse recognition program. Omega Alpha Pharmaceuticals will be providing the selected horse/rider combination with Omega Alpha product of their choice, up to a value of $1,000. About Omega Alpha Pharmaceuticals Inc.
Omega Alpha Pharmaceuticals Inc. is Canadian owned and incorporated in 1992, and with the approval of Health Canada, Omega Alpha Pharmaceuticals has concentrated its efforts into producing and manufacturing herbal supplements and remedies. As a pharmaceutical company, all herbal supplements and health products manufactured by Omega Alpha Pharmaceuticals Inc. are done so following rigid standards and uncompromising quality. Omega Alpha Pharmaceuticals Inc. specializes in formulations for enhancing equine health and performance, using the finest natural ingredients available. For a list of the wide range of products for the optimum health and performance of humans, equines and pets, please visit www.OmegaAlpha.ca .